Skiers and riders often ask “should I ship my skis, rent, or pay the excess bag fees to the airlines.” The editors of Family Ski Trips have done all three. Always bring your own ski boots on the plane. Also pack your ski essentials in your carry on: goggles, gloves, ski pants and jacket – so if all else is lost, you can still ski. It’s easier to rent skis and poles, buy long underwear, even clothing, than it is to find a comfortable pair of ski boots in S.O.L. circumstances. See our ski packing checklist. Shipping your skis can cut down on the excess of gear you have to haul to the airport, and improve your odds of delivery. We trust FedEx far more than the airlines. Your skis are picked up at our doorstep three days prior to departure, and arrive at our ski destination as scheduled. The expense, about $100 a ski bag with poles round trip, is worth the assurance (read: FedEx tracking number) that your alpine gear is safe and sure to be there – versus paying excess bag fees and risking lost ski bags with the airlines. Rental skis have the reputation of being old, heavily used gear with sharpie pen “rental” plastered for all to see. 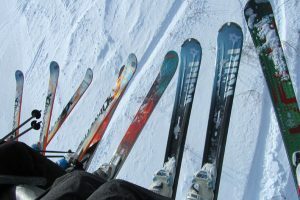 We discovered SkiButlers.com as a high performance, high service alternative. Your Ski Butler meets you upon arrival and sets you up on the top shelf skis you reserved online from their impressive inventory. With a quick binding adjustment, you can be skiing on your arrival day without stress of baggage claim, or long lines at the rental shop. Ski Butlers has a selection of wider powder skis, a nice option for East Coasters like me who don’t own fat skis. 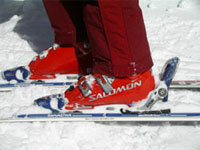 The price ranges from $39 a day and up for the latest skis and poles or a snowboard. Ski Butlers has won awards for their service inColorado, Utah, Lake Tahoe California, Jackson Hole Wyoming and Whistler. For more ski travel tips, see our ski packing tips guide and ourbest ski reviews.